The Central Coast is a remote area of BC, and as such it requires some planning and dedication to visit. Below you will find some information and links about visiting locations throughout the Central Coast. More information about the communities found in these locations can be found on our Communities page. Port Hardy to the south, Bella Bella, Bella Coola, and Prince Rupert to the north are the main transportation hubs on and around the Central Coast, and access to other communities is usually through one of these locations. Pacific Coastal Airlines serves Port Hardy, Bella Bella, Bella Coola, and Klemtu, along with other BC locations including Victoria and Vancouver. Chartered planes and boats may also be available, depending on where you plan to visit. Road access - Bella Coola is the only Central Coast community that is accessible by road; Kitimat, Terrace, and Prince Rupert on the North Coast also have road access from the interior of BC, and Port Hardy has road access from the rest of Vancouver Island. BC Ferries - The Discovery Coast Passage operates in the summer only, and runs between Port Hardy on the north tip of Vancouver Island and Bella Bella, Shearwater, Klemtu, Ocean Falls, and Bella Coola. The Inside Passage runs between Prince Rupert and Port Hardy with stops in Bella Bell and Klemtu. For ferry service to these locations outside summer months, see the Inside Passage Fall/Winter/Spring schedule. Wherever you go on the Central Coast, please be respectful of the environment and local communities. Be conscious of whether you are on traditional First Nations territory, and if you are in a BC Parks conservancy area. Please also be aware of these important Wildlife Guidelines. Reporting wildlife sightings and incidents - If you spot a species you know to be at-risk or under-studied, an animal in distress, or an incident you think should be reported, please report this information to an authority such as Fisheries and Oceans Canada (DFO), the BC Cetacean Sightings Network, or the Coastal Guardian Watchmen. Please especially report sightings of sea otters, whales, dolphins, porpoises, and sea turtles, as many of these species are endangered or threatened. The area of Calvert Island is split between the Hakai Luxvbalis Conservancy in the north and the Calvert Island Conservancy in the south. Camping is allowed, but there are no facilities. Check out these websites for information on activities and management, as well as general safety considerations. The Hakai Institute is on private property in Pruth Bay, and only provides accomodation for scheduled visitors, but welcomes other visitors who wish to explore Calvert Island's natural beauty. Visiting boaters are welcome to anchor in Pruth Bay (100 m from the dock to allow float plane access) and access the dock using dinghies. There is currently interim public access allowed on the trail between Pruth Bay and West Beach - please check this BC Parks notification for more information, and stop by the Welcome Centre for updated information. More location information and arial maps are available on the Hakai website. Getting to Calvert Island: Access is via private or chartered boat or float plane through one of the locations listed in General Travel Information above. Bella Bella is the closest of these communities. 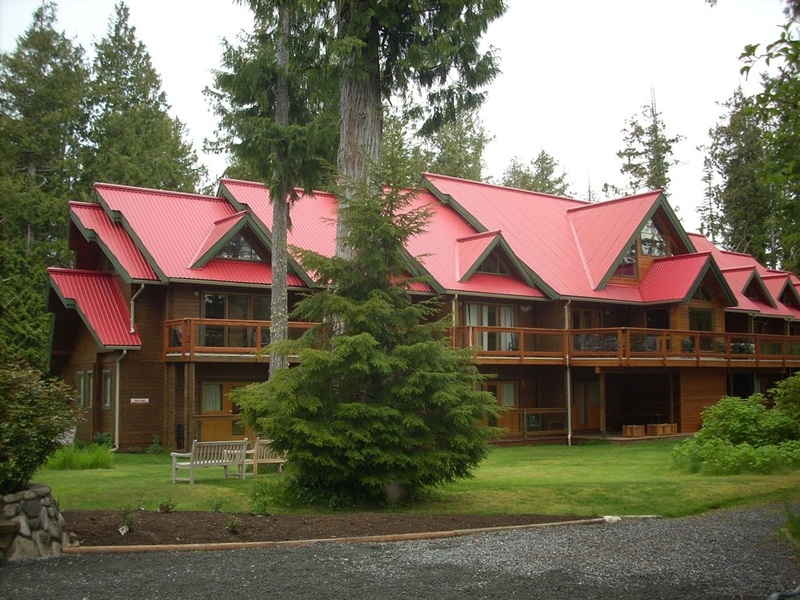 The Hakai Institute lodge. Photo by Julie Mundy. 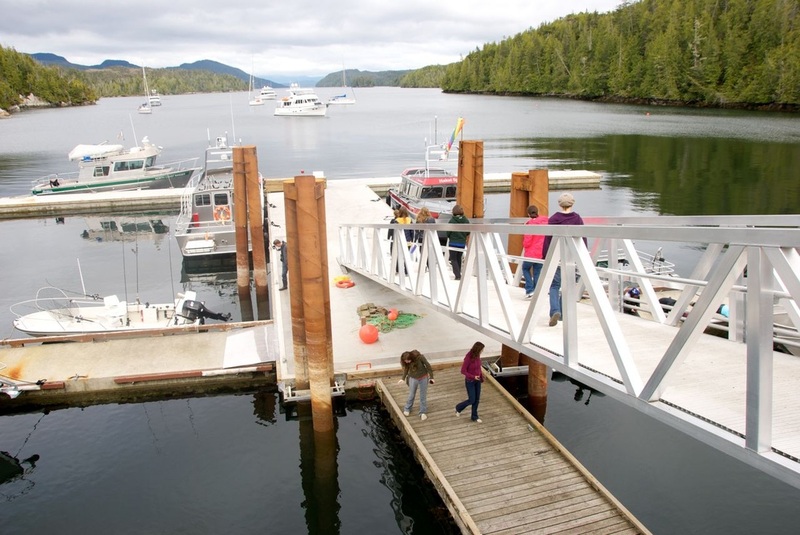 The Hakai Institute dock in Pruth Bay, with Kwakshua Channel in the distance. Photo by Stuart Higgs. Bella Bella is a small community of about 1500 people, and is the home of the Heiltsuk First Nation. It is located on Campbell Island, and is one of the main transportation hubs along the Inside Passage. There is a small airport, a BC ferries dock, a hospital, an RCMP police station, a Coast Guard facility, and other facilities and amenities including accommodation. Bella Bella is a modern community with strong cultural, traditional, and environmental connections. Read more information about Bella Bella on the Qqs Projects Society and the Central Coast Regional District websites. Getting to Bella Bella: See the General Travel Information above, as well as the excellent directions provided by the Qqs Projects Society. The community of Bella Coola is lcoated on the mainland coast of BC, at the mouth of the Bella Coola River. It has a population of about 1900, and is the only Central Coast community that is accessible by road. The Bella Coola Valley is home to the Nuxalk First Nation. The community has a hospital, airfield, docks, stores and restaurants, local accommodation, and other facilities and amenities. Read more information about Bella Coola on the Nuxalk Nation, Bella Coola Valley, and Central Coast Regional District websites. Getting to Bella Coola: See the General Travel Information above, as well as FAQ #3 on the Nuxalk Nation website or the Bella Coola Valley website. Klemtu is a small community of about 400 people, located on Swindle Island. It is home to, and on the traditional land of, the Kitasoo/Xai'xais First Nation. It is also home base for the locally owned and operated Spirit Bear Lodge, which offers accommodation as well as wildlife viewing and guiding services. Read more about Klemtu and the traditional Kitasoo/Xai'xais territory on the Spirit Bear Lodge website. Getting to Klemtu: See the General Travel Information above. Ocean Falls is a small community on traditional Heiltsuk territory, located in Cousins Inlet on the mainland coast of BC. It has accommodation, fishing facilities, some stores, and docks, along with other facilities and amenities. Read more about the community on the Central Coast Regional District and Travel Ocean Falls websites. Getting to Ocean Falls: See BC Ferries under General Travel Information above. This village is home to the Wuikinuxv First Nation. It has a small airfield, docks, a health centre and fire hall, along with other facilities. There are bed and breakfasts available, and regardless of your method of transport the community would like to be notified of visitors before arrival. Read more information about the village on the Wuikinuxv and Central Coast Regional District websites. Getting to Oweekeno: The Wuikinuxv Nation's website provides information about airline and boat transportation as well as accommodation. Please note that you should notify the community before your arrive even if you are travelling in your own boat, as they have information on when is best to navigate the river. Shearwater is a small community on Denny Island close to Bella Bella, and is part of traditional Heiltsuk land. There is an airstrip, docks, accommodation, and other facilities and amenities. Read more about Shearwater and Denny Island's services on the Denny Island Tourism and Central Coast Regional District websites. Getting to Denny Island: Shearwater is very accessible from Bella Bella, and is also on the Discovery Coast Passage route. See BC Ferries and chartered airplane links under General Travel Information.